Our Patriot PBX are full-range pedal board cables made in the U.S.A. Hand built in our custom shop with either G&H Black and Gold 1/4" plugs or our all new design flat "PCNS RA" plug on the other end. This is a great sounding cable for bass players and guitar players. 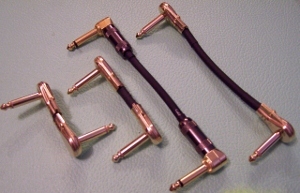 Some cables with “good” high end are harsh or brassy sounding. Not this one! The top end is clear and punchy with superb presence. This is achieved without compromising a great bottom end. The custom designed "PCNS RA" plug can really help free up space on your pedal board. It is not only low profile but also has a short back end so you and turn tigh corners. Please see our Patriot PBX page for pictorial examples. The RA plug is specially designed with corrosion resistant gold platting and copper core and center shaft for excellent sound quality. They are well insulated to prevent grounding shorts and our cable removal tool will help you plug and unplug your cables with ease saving your fingers for playing your instrument. The best part about the Patriot PBX is the exchange program. Measure up your pedal board, place your order and once your get your cable you find out your need to make some "adjustments", no problem, drop a note and we'll give you information on how to exchange your cable for the length you need! Please visit our Patch cable page for instructions on measuring your patch cables BEFORE ordering your cables.